﻿ Handheld ultrasound: Threat or opportunity? Handheld ultrasound: Threat or opportunity? A “controversies” session at the 2012 Radiological Society of North America (RSNA) meeting in Chicago gathered some radiology leaders for a frank discussion of the current state of ultrasound (US) in the field and what the future may have in store. Relentless advances in technology have resulted in shifts in practice patterns, some leading to better patient care, some to a more timely diagnosis, and others to conflicts among service providers. Most radiologists are well aware of the proliferation of compact ultrasound systems among their clinical colleagues. In the era of fee-for-service medicine this development is driven by many factor—some noble; some less so. Consequently, some questions come to mind: What might we radiologists expect in the future? How do we react? How should we position ourselves? The evolution of computer technology, with its constant doubling of processing times, worldwide connectivity and massive storage capacity, affects all aspects of our lives. The same evolution in speed, power and miniaturization has occurred in ultrasound. The development of microprocessors and other technologies has allowed US units to become more compact and more portable. Thus, over the past 15 years, compact US has evolved to to the point where many current units weigh 15 pounds or less. Such disruptive technology, coupled with lower cost, has decreased the barrier for entry into US utilization by our clinical colleagues. All of this started with a U.S. Office of Naval Research contract in 1996 and a matching grant from the U.S. Government Defense Advance Research Project Agency (DARPA) to develop a portable US unit that could be used by troops in the field to help identify and diagnose serious injuries. The DARPA contract was fulfilled when a prototype unit was delivered to the U.S. Department of Defense in November 1998. 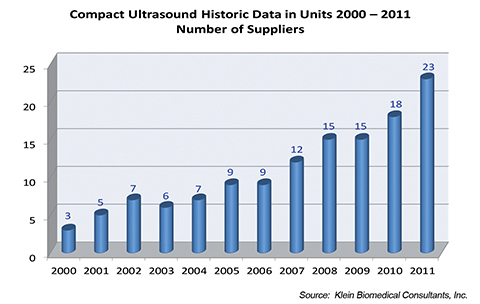 By the year 2000 three U.S. manufacturers had developed compact ultrasound units, and by 2011 at least 23 were selling compact ultrasound machines (Table 1). The number of manufacturers producing these units will no doubt continue to climb. In fact, when we reviewed the sales of compact US units in 2011, these devices accounted for 47% of all systems sold within the United States. It is estimated that less than 1,000 of these units were sold in 2000. This number increased to 5,000 units by 2005 and over 10,000 in 2011 (Table 2). 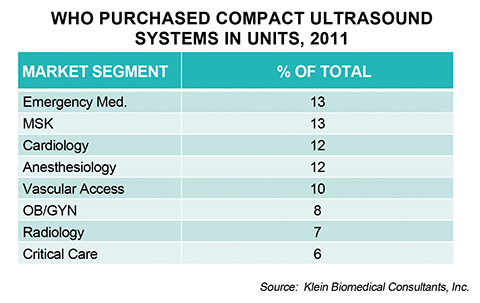 Radiology services accounted for only 7% of the total sales of these compact US units. Clearly, these units are widely accepted by nonradiologists (Table 3). Thanks to ongoing miniaturization, ultrasound hardware now includes viewing screens that can fit into the palm of your hand, contributing to further proliferation. Other studies show striking trends. For instance, a publication by Sharpe et al.1 shows continued growth of US-guided invasive procedures performed by radiologists, from 563,323 performed in 2004 to 794,497 in 2010 (a 41% increase). More surprising, however, is the fact that US-guided procedures performed by nonradiologists increased from 322,921 in 2004 to 922,672 in 2010—a 180% increase. Based on this data, US utilization demonstrates more dramatic growth among nonradiologists. In fact, in 2010, for the first time, more US-guided invasive procedures were performed by nonradiologists than by radiologists. Could self-referral be a reason for this remarkable increase? This is unlikely the case in radiology services that rely on the referral-based model. In a 1988 editorial published in Radiology, Roy Filly2 compared the US machine to the stethoscope. He considered that, in the future, the US unit would become a portable instrument that, like the stethoscope, would be available for bedside diagnosis. He cautioned practitioners that while both instruments are very powerful diagnostic tools, they could be misused without appropriate training. He forecast that they would be “used by many, understood by few.” He opined that US may be the most difficult imaging technology to master. He also suggested that effort should be made to integrate ultrasound into medical practice with appropriate education and experience. There are predictions that there will be continued growth in the compact US market, with a growing user base in specialties other than radiology. In a review of data in 2011, a number of specialists were using these compact US systems (Table 3). Surprisingly, musculoskeletal (MSK) specialists purchase 13% of these units, with podiatrists being the main users within this group. Radiologists are not the majority users of these units (Table 3). This raises two very basic questions: Should radiology fear this proliferation of US and how should we radiologists position ourselves in response? Certain models are used by radiology to provide optimal service coverage. For instance, in 2000 McGahan et al3 showed it was cost effective for hospitals to have 24/7 sonographer coverage under the direction of radiologists within the emergency department and in-patient services. The ED received a 5-minute priority on all cases. All studies were interpreted contemporaneously. In this model, all images are stored in PACS for review and follow-up examinations, and also stored in a PACS for comparison with prior exams. All of these images are thus available for clinical use, potential quality assurance purposes or potential outcomes research. It is imperative that all images of record be stored in a central PACS archive that is uniformly accessible by all appropriate hospital users. Lack of a central repository negatively affects medical decision making and could create significant patient care problems. There could be discrepancies in image interpretation if prior studies are not available to compare to follow-up imaging studies, be it another US exam (with another provider in the medical enterprise) or another modality. In fact, image storage is necessary for practice accreditation. Some institutions have attempted joint collaboration using US among departments—for example, between radiology and vascular lab for jointly approved protocols and Continuous Quality Assurance (CQI) for vascular US. Thus, by consensus agreement, all scans would meet equal standards and all images would be available on the same PACS system. All image interpretation in these cases would be accessible via the PACS and the electronic medical record and there would be joint CQI in these cases. This would be the ideal situation. However, in the absence of rigorous administrative control over the acquisition of imaging technology, eventually there would be fragmentation of US, with many splinter groups performing office or hospital US with little or no documentation in the electronic medical record and without central image storage. Rather than documenting a complete US examination, POCUS establishes the answer to a specific question through a limited imaging protocol. For instance, in a patient with right upper-quadrant pain and suspected acute cholecystitis, an US scan of the gallbladder would be performed to evaluate for cholelithiasis and/or findings of acute cholecystitis with no other areas assessed. While previously utilizing US applications described in traditional imaging environments, the number of research studies in POCUS has grown logarithmically. While most applications are similar to established US applications, the variety of US applications practiced by POCUS sonologists is now well over 25 and many are performed by clinicians in the POC setting only.6 Recent US forums have been attended by members of over 40 societies, all of which apply the POCUS approach. Such consensus conferences include POCUS not only to evaluate for pneumothorax and pleural effusion, but also to evaluate pulmonary edema and consolidation.6 Many of these POC applications have found broad clinical use and acceptance. Such examples include peritonsillar abscess detection and drainage guidance, ocular US for trauma and real-time guidance of nasogastric tube placement or intubation.5 Yet many of these applications may be foreign to the average radiologist applying traditional sonographic applications. Ultrasound usage has not only spread to other specialties, but an increasing number of medical schools are incorporating it into four-year medical school curricula. That future may well be upon us as US anatomy and diagnosis has been introduced as a portion of medical school education at several institutions (32 currently have US included in their curriculum, with about 12 having a full four-year curriculum and that number is growing). There is a growing trend toward training medical students in US techniques in the United States. Several medical schools have developed dedicated programs US education. The adoption of US teaching programs in medical schools has been met with enthusiasm by multiple medical specialties. These curricula vary with school in scope and duration. Many of the programs are integrated across all 4 years of medical training. Most of the programs include a didactic component as well as hands-on sessions. The didactic component includes basic ultrasound physics as well as normal and abnormal sonographic anatomy. The hands-on sessions are usually dedicated to different organ systems and allow the student to become familiar with technical aspects of the ultrasound exam as well as artifacts and pitfalls. Most schools incorporate the ultrasound program into the anatomy and physical diagnosis classes to reinforce concepts of normal anatomy and physiology (an ongoing and rapidly evolving process, but currently more schools have US training during the clinical years than in the basic science years). The integration of US into the medical curriculum may play a dual role in student education. Proponents make the case that US can enhance the classroom educational experience and promote the practice of medicine at the bedside. In the classroom, they say, US imaging allows anatomy and physiology to “come alive.” Three-dimensional concepts crystallize as the student visualizes anatomy in real time. An understanding of anatomic relationships is accelerated when US is included in the training. Similarly, physiologic concepts of blood flow and perfusion can be visualized and recognized as normal or abnormal. Thus, current efforts are focused on developing a standardized US program that may be adopted by medical schools. Evidence-based studies are needed to demonstrate improvements in knowledge and clinical practice. Many believe Diagnostic Radiology must be involved in these medical school programs as radiologists have the expertise, experience and access to superior equipment. In summary, a growing number of medical schools have incorporated US into their curricula for the pre-clinical and clinical years. There is no standardized curriculum, but current programs have been well received by students and faculty as they seem to enhance the educational experience and promote US in medical practice. It seems likely that more medical schools will integrate US into their curriculum, thus raising the question of participation by radiologists in these endeavors and of the effect of US use by future practitioners. Common musculoskeletal injuries comprise 7% of all physician visits in the United States and up to 50% of all sports-related injuries.9 According to the American Public Health Association, MSK disorders account for approximately $850 billion per year in healthcare costs and lost wages.10 Accurate and timely diagnosis of MSK injuries are critical to ensure proper treatment and thus to minimize societal cost. Magnetic resonance imaging (MRI) has long been the imaging standard for MSK injuries in the United States. However, MRI is costly and overutilized. Improvements in US technology have made it a rapidly growing alternative to MRI for diagnosing common MSK injuries. This shift to US from MRI is estimated to result in a cost savings of about $7 billion in healthcare expenditures over the next 15 years.11 Indeed, musculoskeletal ultrasound (MSK US) has experienced exponential growth in use over the last 10 years—mostly by nonradiologists12 and due largely to the emergence of new and portable US technology as well as improved computer and transducer technology. Consequently, the barrier for entry into the MSK US market has become much lower for nonradiologists than in the past. Increased accessibility of US equipment and lower cost has also helped to fuel the recent rapid growth in the use of US for MSK applications. With its ability to provide a quick diagnosis to initiate early treatment coupled with growing concerns over rising healthcare costs, MSK US is now an appealing advantage for non-radiologists.9 However, the most defining advantage of US is its real-time imaging capability, which allows for direct needle visualization during US-guided procedures. Patient satisfaction is also high because US can both diagnose and guide treatment of various MSK injuries during a single appointment. Real-time US guidance to increase accuracy of needle placement and avoid vital neurovascular structures has helped accelerate point-of-care market growth. Have radiologists lost MSK US? A recent analysis of Medicare data on MSK US utilization rates was performed by Sharpe et al at the Thomas Jefferson University Hospital Center for Research on Utilization of Imaging Services. Although their analysis was limited to diagnostic exams in the Medicare population, the trends found in MSK US utilization from 2000 to 2009 provide insights into the various users and perhaps give an indication that point-of-care MSK US may pose a real threat to radiology. Over the past decade, MSK US volume increased from 56,254 diagnostic exams in 2000 to 233,964 exams in 2009 (+316%).12 In every year, radiologists performed the greater percentage of MSK US exams. 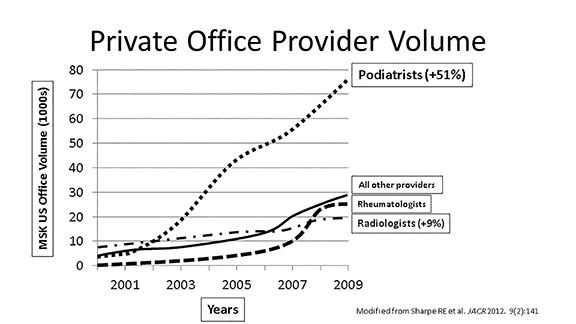 However, radiologists accounted for only a mild increase in this volume compared to podiatrists12 (Figure 1). Of note, the proportion of the total volume of studies performed by radiologists decreased from about 73% in 2000 to 39% in 2009 indicating a significant loss of market share to nonradiologist users, who include orthopedic surgeons, sports medicine physicians, physical medicine rehabilitation physicians, podiatrists and rheumatologists. Interestingly, however, the highest utilization rate was found among podiatrists. Podiatrists accounted for a 1,847% increase in MSK US exams performed from 2000 to 2009 (Figure 1).12 The proportion of total MSK US volume performed by podiatrists was about 33% in 2009. Therefore, over the last decade, the rate of increase of MSK US exams performed by podiatrists was significantly higher than radiologists and other nonradiologists. Increasing utilization of MSK US, especially in the private office setting, has raised concern for adequate regulation and quality control standards. MSK US is not easy to perform and requires an experience-based “steep” learning curve. To help mitigate poor quality in this rapidly growing environment, a practice accreditation process for MSK US has recently been introduced by the American Institute of Ultrasound in Medicine (AIUM).13 The purpose of accreditation is to set high standards for practices performing MSK US exams by meeting or exceeding nationally recognized benchmarks in the performance and interpretation of MSK US exams. MSK US practices meet requirements by demonstrating competency in their practice as determined by education, training, experience, image storage, instrumentation and quality assurance. More importantly, practice accreditation helps to ensure that patients will receive a safe MSK US exam that will be competently performed and interpreted. Accreditation also helps to meet quality assurance requirements of health insurers. Therefore, as the number and diversity of practitioners of MSK US exams continues to grow, regulation and proper oversight to maintain high practice standards will become vitally important. In summary, while radiologists have increased their utilization of US, this growth has been outpaced by that of nonradiologist practitioners. 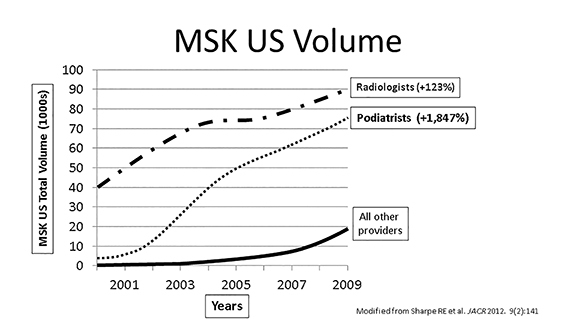 MSK US utilization has increased exponentially over the past decade, especially among podiatrists. As more MSK US exams are performed outside of traditional imaging groups, practice accreditation will be important for maintaining high quality standards. This review presents a number of important facts and also raises a greater number of important questions. Some questions are easy to answer, while others are more difficult. 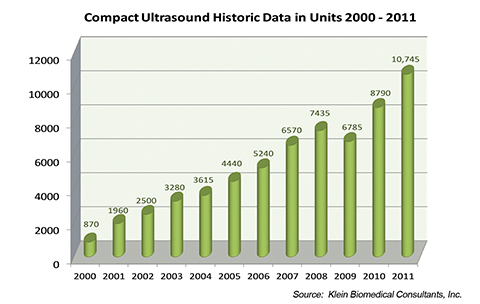 First, will the use of portable US units and applications for POCUS continue to increase? This answer is obvious, as recent data show ever-increasing use of these applications by many nonradiologists. Second, is there real improvement in patient care with the use of POCUS? The answer to this question is more complex. For instance, no one can deny that the increasing use of ultrasound for vascular access in the ED should improve patient care. Furthermore, in the ED, where radiology services are not readily available 24/7, it would seem that the use of POCUS for a binary life or death decision should improve patient care. However, does a POCUS examination in the ED better serve the patient than a complete US exam in the radiology department? It would seem the former, if performed competently, should be a better exam. In fact, why do we perform an ultrasound exam – because we are uncertain of the diagnosis? Can we be certain of the diagnosis of acute cholecystis as a yes or no decision, having already dismissed possible biliary dilation or a renal stone? As for image storage, all images should be centrally stored long term for image comparison. How many times in imaging are prior images the key to a diagnosis? This availability is imperative to patient care for comparison with future imaging and allowing all involved physicians access to imaging results. Medicine cannot be practiced in silos; there is a need for multispecialty collaboration and information sharing. Third, how should radiologists involve themselves in medical school education of US? It is logical that radiologists should take a lead role, but we have failed to do so in some schools. We need to be more involved because, in the eyes of future practitioners, it will establish the radiologist as the true expert in ultrasound. Finally, will US exams performed by radiologists decrease dramatically in the future? It probably will not. While some procedures such as vascular access or thoracentesis will be guided by other US users, in other instances, radiologists’ use may increase. Certainly, questions will be raised by less experienced users which will eventually be referred to radiology for a comprehensive and well documented exam. While others have discovered the many advantages of US, radiologists should continue to be the major providers and educators of high-quality sonography. Sharpe RE, Jr., Nazarian LN, Levin DC, Parker L, Rao VM. The increasing role of nonradiologists in performing ultrasound-guided invasive procedures. Journal of the American College of Radiology JACR. 2013;10:859-863. Filly RA. Ultrasound: the stethoscope of the future, alas. Radiology. 1988;167:400. McGahan JP, Cronan MS, Richards JR, Jones CD. Comparison of US utilization and technical costs before and after establishment of 24-hour in-house coverage for US examinations. Radiology. 2000;216:788-91. Royse CF, Canty DJ, Faris J, Haji DL, Veltman M, Royse A. Core review: physician-performed ultrasound: the time has come for routine use in acute care medicine. Anesthesia and analgesia. 2012;115:1007-1028. American College of Emergency P. Emergency ultrasound guidelines. Annals of emergency medicine. 2009;53:550-570. Volpicelli G, Elbarbary M, Blaivas M, et al. International evidence-based recommendations for point-of-care lung ultrasound. Intensive care medicine. 2012;38:577-591. Solomon SD, Saldana F. Point-of-care ultrasound in medical education—stop listening and look. The New England Journal of Medicine. 2014;370:1083-1085. Butter J, Grant TH, Egan M, et al. Does ultrasound training boost Year 1 medical student competence and confidence when learning abdominal examination? Medical Education. 2007;41: 843-848. Kannus P, Natri A. Etiology and pathophysiology of tendon ruptures in sports. Scandinavian Journal of Medicine & Science in Sports.1997;7:107-112. Jozsa L, Kannus P. Histopathological findings in spontaneous tendon ruptures. Scandinavian Journal of Medicine & Science in Sports.1997;7:113-118. Parker L, Nazarian LN, Carrino JA, et al. Musculoskeletal imaging: medicare use, costs, and potential for cost substitution. Journal of the American College of Radiology JACR. 2008;5:182-188. Sharpe RE, Nazarian LN, Parker L, Rao VM, Levin DC. Dramatically increased musculoskeletal ultrasound utilization from 2000 to 2009, especially by podiatrists in private offices. Journal of the American College of Radiology. 2012;9:141-146. Handheld ultrasound: Threat or opportunity?. Appl Radiol. Dr. McGahan is Professor and Vice Chair, Department of Radiology, University of California, Davis Medical Center, Sacramento, CA; Dr. Pozniak is a Professor of Radiology and Chief of Body CT; and Dr. Lee is an Associate Professor of Radiology, at the University of Wisconsin School of Medicine and Public Health, Madison, WI; Dr. Cronan is a radiologist at Rhode Island Hospital, Providence, RI; Dr. Pellerito is Vice Chair, Clinical Affairs in the Department of Radiology, North Shore LIJ Health System, and Associate Professor of Radiology, Hofstra North Shore LIJ School of Medicine, Manhasset, NY; Dr. Blaivas is a Professor of Medicine and Emergency Medicine at the University of South Carolina School of Medicine and St. Francis Hospital, Columbus, GA, and President of the Society of Ultrasound in Medical Education; Dr. Cooperberg is Professor Emeritus of Radiology, UBC, Vancouver, British Columbia, Canada; and Dr. Klein is President of Klein Biomedical Consultants, New York, NY.